Sarah Beeny’s “Renovate Don’t Relocate” is a property show with a difference. 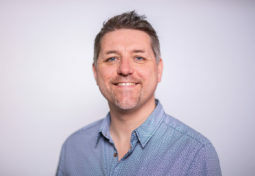 Produced by Outline Productions and commissioned by UKTV for broadcast on free-to-air channel, Really, the show uses AV technology to help property owners experience how renovating their homes can transform the way they live. Outline Productions approached Anna Valley to design and provide a technical solution to displaying the floorplans for “Renovate Don’t Relocate” in an interactive way. 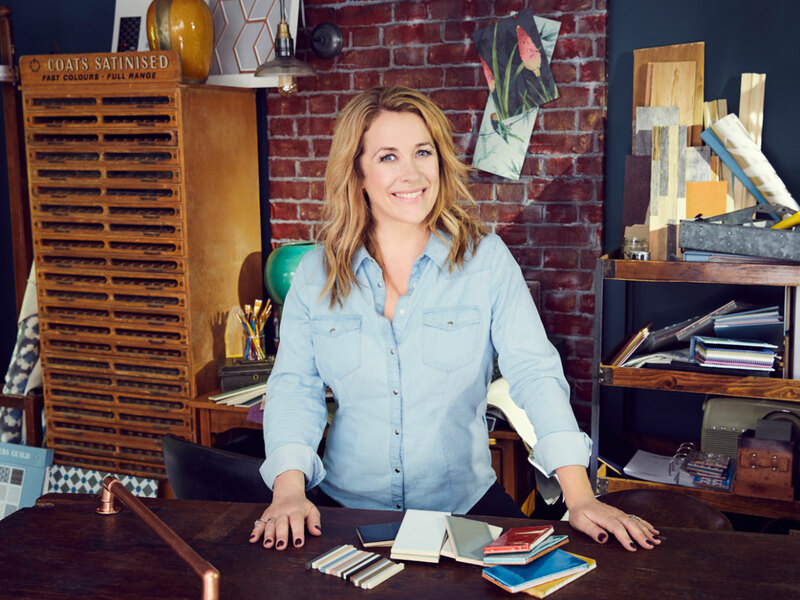 The creative team wanted to display architectural designs of the renovations so that Sarah Beeny and the homeowners could explore the space at the actual scale of the proposed final build. 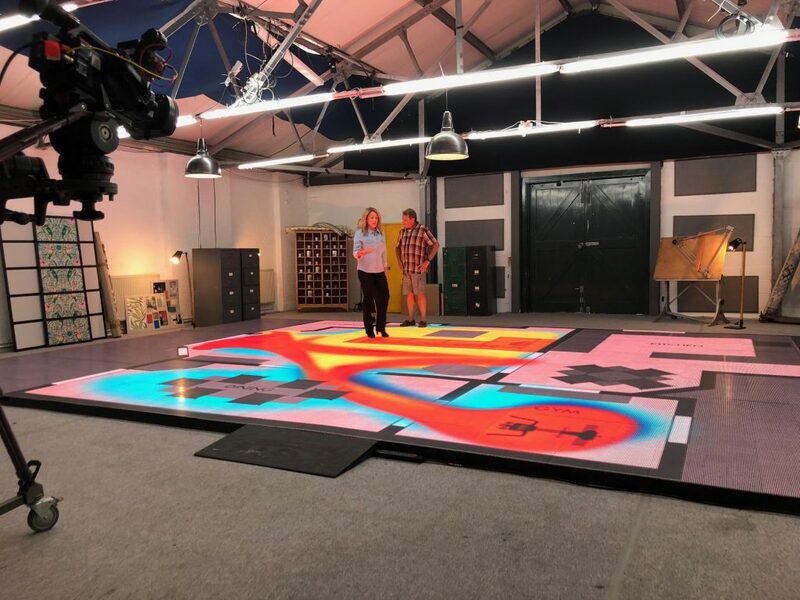 The production team was initially interested in a similar approach to the one that Anna Valley originally designed for “Dancing on Ice.” This requires several projectors, each displaying a section of a larger image, to be precisely positioned to “build” the bigger picture. 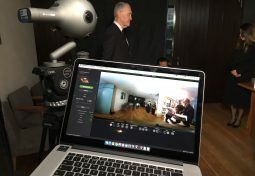 Edge-blending software then blurs the lines between each projector’s output so that the image appears to be coming from one source. But projection wasn’t a viable solution for “Renovate Don’t Relocate” for a number of reasons. Firstly, this effect can only be achieved in a large sound-stage style venue with loads of vertical space, which went against Outline’s brief for a more intimate design-studio as well as their location parameters. Perhaps more significantly, projecting down onto the studio floor would mean that objects placed on the floor (or people moving around the space) would create shadows and disrupt the image. The Anna Valley team proposed that LED flooring be used instead and held workshops with the crew to demonstrate the resolution, brightness and versatility of LED flooring as well as to advise on the technical considerations that need to be taken into account when shooting these displays. The final “Renovate Don’t Relocate” set was built out of NX7 LED flooring and measured an impressive 94 square meters. Pixel-matched floorplans and animated heatmaps showing traffic patterns were displayed on the floor using a MacBook Pro input and furniture was moved around on the floor to see how it would fit into the renovated spaces – interaction that would not have been possible with any other approach. The show was primarily produced using Anna Valley’s Sony FS7 studio-style multicamera gallery, while a small overhead camera rig was constructed to capture a birds-eye view of the floorplans. 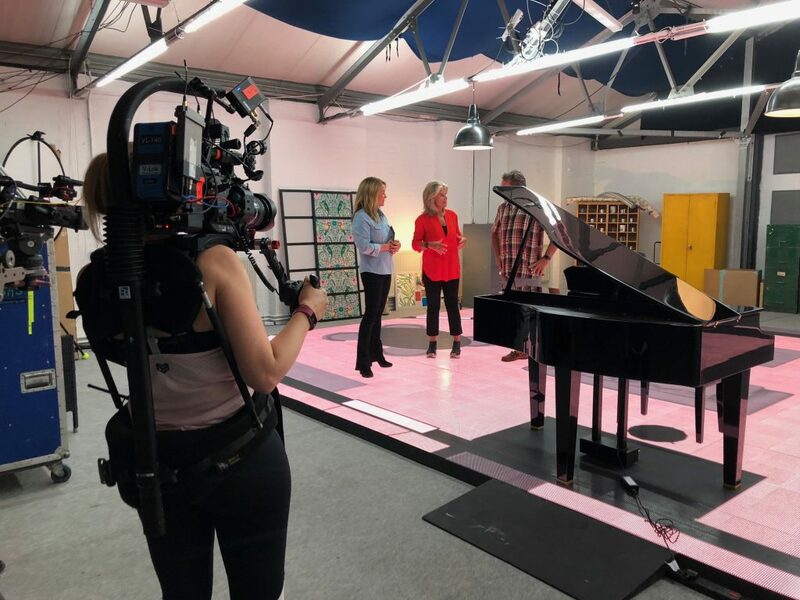 Sarah Beeny’s “Renovate Don’t Relocate” broadcasts from 25 March – 19 April 2019 at 8pm on Really. Catch up on shows are available on Really UKTV Play. 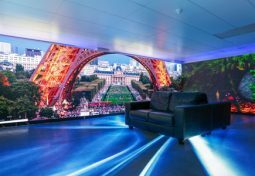 Get in touch with Anna Valley to find out more about using LED displays for broadcast projects.